Lord Rugdumph's Estate is a farm and estate north of Cheydinhal (quest-related). This is the home of Lord Rugdumph gro-Shurgak and his daughter Rogbut gra-Shurgak, both Orcs of noble standing. Lord Rugdumph has a "unique" pattern of speech, while his daughter is much coarser (and far tougher). She would prefer the life of a fighter but is forced to act as a "lady" by her noble father. The estate contains the main manor and the servant's quarters (although no servants are ever to be seen). The main estate building is a somewhat small, but upper-class building consisting of two floors. After opening the front door, to your left is a statue and a chair and to your right you will find two chairs and a dining table that holds two bread loaves, a pumpkin, five strawberries in a silver bowl, and a selection of silver dining ware and dishes. To the right of the table is a chest that holds clutter. North of the table is a cozy fireplace and another chest that contains some weapons and armor. To the southwest of the fireplace are the stairs that lead up to the second floor. After heading up the stairs, the first thing you will see on the second floor is a chair and a set of drawers containing some clothes with a silver urn situated on top of them. North of the drawers is a small bedroom area containing a single size bed, a chest that holds clutter, and a cupboard that contains some clothing. After heading past the balcony and reaching the far eastern part of the second floor, you will find yourself in a master bedroom complete with a double bed located in the southern corner of the room. North of the bed situated against the wall is a chair and a set of drawers containing a selection of clothes. On top of these drawers is a chest containing clutter, a copy of The Red Book of Riddles, and a Nirnroot growing in a pot. The servant's quarters is a small shack located to the east of the manor. After heading through the front door, you will find yourself in a lower-class building containing three beds and a few pieces of furniture. To your left, you will find two chairs and a table that holds a cheese wedge, a bread loaf, three tomatoes inside a bowl, and a selection of lower-class dishes and silverware. A set of drawers containing clutter are located near this table, situated in the southwest corner of the building. North of the table is a small fireplace and one of the three beds inside the quarters. In between this bed and another bed to the east is a set of shelves that hold an assortment of lower-class dishes and a covered pot that may contain some food. In the northeast corner you will find the third bed and another set of shelves that hold three cheese wedges, two bread loaves, and three carrots. In between the shelves and a nearby fireplace is a grain sack and another sack that contains clutter. South of this fireplace is a chair with a sack containing clutter located behind it. Near this chair in the southeast corner of the building is a table that holds a cheese wedge, a covered pot that may contain some food, and some common books along with two accompanying chairs. Beside this table, near the door, is a set of drawers containing clutter with a pair of huntsman leather pants on top of them. The front door of the manor is unlocked. However, entering the house will be considered trespassing unless the related quest is active. The interior is called "Lords Rugdumph's Estate", with an "s" at the end of "Lord". This issue has been addressed by the Unofficial Oblivion Patch; the extra "s" is removed. 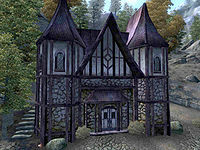 Lord Rugdumph's Estate appears in ESO as the Shurgak Clan Estate. This page was last modified on 22 November 2018, at 03:40.